Six ships deported the Acadians to Massachusetts. The Ship Helena left Annapolis Royal on October 27, 1755 arriving in Massachusetts on January 5, 1756 with 323 Acadians aboard. The Schooner Race Horse left Pointe des Boudrots on December 20, 1755 arriving in Massachusetts on December 26, 1755 with 120 Acadians aboard. The Sloop Seaflower left Pisiquid on October 27, 1755 arriving in Massachusetts on November 15, 1755 with 206 Acadians aboard. The Brigantine Swallow left Pointe des Boudrots on December 13, 1755 arriving in Massachusetts on January 2, 1756 with 236 Acadians aboard. The Sloop Vulture left Port Latour date unknown arriving in Massachusetts May 10, 1756 with 72 Acadians aboard. The Sloop Eagle left Halifax on April 1, 1756 arriving in Massachusetts on May 29, 1756 with 4 Acadians aboard. Recd. January 3d 1756 Note: The above is written as is from the original record. Joseph DUGAS, s/o Abraham/Marie-Madeleine LANDRY, m. to Marguerite ROBICHAUX, d/o Alexandre/Anne MELANSON. Children: Marguerite (1730); Alexandre (1732); Marie-Madeleine (1734); Marie-Joseph (1737); anne (1739); Marguerite (1742); Abraham (1745); Isabelle (1746); Monique (1749); Pierre (1751). Marguerite ROBICHAUX buried 1752 at Port Royal. Family deported to Massachusetts 1755. Isadore GOURDEAU, s/o Pierre/Marguerite ROBICHAUD, m. to Madeleine DUGAS, d/o Joseph/Marguerite ROBICHAUD. Children: Joseph (1759); Pierre; Pierre-Jacques(1762); Jean-François (1765). Jacques MIUS d'ENTREMONT of Pobomcoup, s/o Jacques de Pobomcoup/Anne ST-ETIENNE de LA TOUR, m. to Marguerite AMIRAULT, d/o François/Marie PITRE. Children: Jacques (ca. 1724); Anne (1732); Paul (ca. 1734); Benoni (ca. 1735); Joseph (ca. 1736). Deported to Boston 1755 and at Pubnico, N.S. ca. 1767. Abel DUON, s/o Jean-Baptiste/Agnès HEBERT, m. at Boston ca. 1758 to Anne MIUS d'ENTREMONT, d/o Jacques/Marguerite AMIRAULT. At Cap Sable 1769. Jacques AMIRAULT, s/o François/Marie PITRE, m. to Jeanne LORD, d/o Alexandre/Françoise BARILLOT. Children: Jacques (1732); Joseph (1734); Ange (ca. 1736); Isidore (1742); Lucie-Ursule (1745); Anastasie (1748); Basile (1752). Deported to Boston 1756, returned 1767 to Pubnico, and lived on the coast west of the harbor. Several sons settled at Baie Ste-Marie and Pubnico. Jacques AMIRAULT, s/o Jacques/Jeanne LORD, m. to Marie BELIVEAU, d/o Pierre dit Pio/Jeanne GAUDET. Children: Marie (1759); Joseph (1760); Nathalie (1762); Marie-Suzanne (1764); Rosalie (1767); Geneviève (1769). Went about 1764 to Butte des Amirault at Ste-Anne de Ruisseau, county of Yarmouth, N.S. In obdeience to the order of the General Court dated January 21, 1757, the following is a list of names of circumstances of the French Inhabitants of Nova Scotia now residing in the Town of Braintree taken by the selectmen this 25th day of April 1757. Pierre BREAUX, s/o Vincent/Marie BOURG, m. secondly ca. 1705 to Anne LEBLANC. Children of second marriage: Joseph (1706); Catherin (1708); Isabel (1712); Pierre (1713); Paul (1717); Brigitte (1719); amand (1721). Joseph BREAUX, s/o Pierre/Anne LEBLANC, m. to Elizabeth THIBODEAU, d/o Michel/Agnès DUGAS. Children: Marguerite (1738); Joseph (ca. 1739); amand (ca. 1740); Joseph Samuel (ca. 1742); Jean-Anselme (ca. 1748). at Massachusetts 1755 and at l'Assomption, Québec 1767. Amand BREAUX, s/o Pierre/Anne LEBLANC, m. to Madeleine LEBLANC, d/o François/Jeanne HEBERT. Children: Anne-Marie (1746); Jean-Baptiste (1748); Joseph-Richard (1750); Madeleine (1752); Marguerite (1754); Marie-Anne-Ange (1758); Joseph-Amand (1761). At Massachusetts 1755 and at St-Ours, Québec 1766. François LEBLANC, s/o René/Anne BOURGEOIS, m. to Jeanne HEBERT. Children: François (1706); Jacques (1707); Anne (1708); Marie (1710); Joseph (1712); Marguerite (1716); Cécile (1717); Marie-Josephe (1720); Madeleine (1722); Jean-Baptiste (1725); Beloni (1729). Jacques LEBLANC, s/o François/Jeanne HEBERT, m. to Catherine LANDRY, d/o Piere/Madeleine BROUSSARD. Children: Marie-Madeleine (1743); Jean-Baptiste (1745); Benoni (1750). Some of this family was sent to Maryland. Anthony TERRY, Margaret his wife, Margaret, Elizabeth, Mary, Joseph, Hannah, Peter their children, Elizabeth PEACOT, Joseph BROW Snr. Philip TEBEDO, Elizabeth his wife, Elizabeth his wife, Joseph his son?, LANNON?, Susanne do, Mary do, Joseph BLANCHER, Joseph BASSELL, Jane his wife, Joseph and Margaret their children. All the above now residing in Roxbury. ------sd. Committee further report that they gave over to the select men of the several towns where the sd. French people then resided to Remove them according to the foregoing Distribution and directed the Select Men of the Several towns where they were Destined to Receive them accordingly. Jacques VIGNEAU dit MAURICE, s/o Maurice/Marguerite COMEAU, m. to Marguerite ARSENAU, d/o Abraham/Jeanne GAUDET. Children: Pierre (1726); Jacques (1730); Joseph (1732); Abraham (1733); Jean (1734). At Massachusetts 1755, and at Miquelon 1767 and 1772. Was a merchant at Baie Verte before deportation. Some of his children and families with him at Roxbury and at Boston. Jacques BOURGEOIS and Marie BOURG were parents of Marie-Anne BOURGEOIS, wife of Joseph VIGNEAUX, above, born 1732. Pierre BREAUX and Anne LEBLANC were with son Amand and his wife Madeleine LEBLANC and children Margeurite and one other child. Joseph BREAUX, s/o Joseph/Elizabeth THIBODEAUX, married to Marie-Anne PICOT, d/o MichelAnne BLIN. François BENOIT, s/o Claude/Jeanne HEBERT, married at Boston ca. 1761 to the above Françoise DAIGLE. At Yamachiche, Québec by 1767. Philippe THIBODEAU, s/o Pierre/Anne BOURG, m. to Isabelle (Elizabeth) VINCENT. Children: François (ca. 1715); Charles (1723); amand (1727). From Pisiquid. At Boston 1755. Jacques LEBLANC, s/o François/Jeanne HEBERT, married to Catherine LANDRY, d/o Pierre/Madeleine BROUSSARD. Children: Marie-Madeleine (1743); Jean-Baptiste (1745); Benoni (1750). At Massachusetts and Maryland 1755. Alexis BREAUX, possibly s/o Antoine/Marguerite DUGAS, m. to Marguerite BARILLOT. Children: Joseph (1747); Jean-Baptiste (ca. 1748); Marie (ca. 1749); Charles (ca. 1750); Firmin (ca. 1754); Elizabeth (ca. 1756); Marguerite (ca. 1758); Françoise-Rose (1762). At Massachusetts 1755 and Laprairie, Québec, Canada 1767. Claude BENOIT, s/o Claude/Jeanne HEBERT, m. to Anne GIROUARD, d/o François/Anne BOURGEOIS. Children: Joseph (1749); Jean-Baptiste (1756); Pierre (1759); Marguerite (1765). At Massachusetts 1755 and at St-Ours, Quäbec, Canada 1767. Claude BENOIT, s/o Pierre Elizabeth LE JUGE, m. to Marie COMEAU. Children: Rosalie (1737); Marguerite (1741); Esther (1746); Laurent (1748); Jeanne (1751). Deported to Massachusetts 1755 and at Yamachiche, Québec, Canada 1767. Abel DUON, s/o Jean-Baptiste/Agnèes HEBERT, m. to Anne MIUS d'ENTREMONT, d/o Jacques/Marguerite AMIRAULT. Abel at Boston 1755. Family at Cap Sable 1769. Jacques AMIRAULT, s/o François/Marie PITRE, m. to Jeanne LORD, d/o Alexandre/Françoise BARILLOT. Children: Jacques (who m. Marie BELIVEAU); Joseph, Ange, Isidore, Lucie-Ursule, Anastasie, Basile. At Boston 1756, returned to Pubnico 1767. François LEBLANC, s/o Jacques/Catherine HEBERT, m. to Marguerite BOUDROT, d/o Claude/Anne-Marie THIBODEAU. Children: François (1712); Joseph (1718); Elizabeth (1721); Charles (1723); Pierre (1725); Etienne (1728); amand (1731); Jacques (1732); Simon (1734); Marguerite (1737); Elizabeth (1739). Paul MIUS, b. ca. 1734, and Benoni MIUS, b. ca. 1735, s/o Jacques Marguerite AMIRAULT, were at Boston 1755. returned to Pubnico ca. 1767. Ange, Isidore and Lucie-Ursule, children of Jacques AMIRAULT/Jeanne LORD, were at Boston 1756 and returned to Pubnico 1767. Paul LANDRY, s/o Jean/Madeleine MELANCON, m. at Massachusetts 1759 to Rosalie BENOIT, d/o Claude/Marie COMEAU. Marriage rehabilitated 1767 at Trois-Rivières. Three children born between 1760-1764. At Yamachiche, Québec, Canada 1767. All of the families listed here were Deported to and Residing in Boston. I am listing the research done first on these families and will post the Boston Archive record later. Pierre CYR, s/o Guillaume/Marguerite BOURG, m. to Madeleine POIRIER, d/o Michel/Madeleine DUGAS. Children: Marie-Josephe (1740); Jacques (1742); Charles (1744); anastasie (1748); Rosalie (1750); Laurent (1752); Victoire (1753); Pierre (1761). At Boston 1755 and at Miquelon 1763-1772. Magloire HEBERT, s/o Jacques/Jeanne GAUTEROT, m. to Anne CYR. Children: Félix (1744); Charles (1751); Anastasie (ca. 1753); Madeleine (1759); Joseph (1762). At Boston 1755 and St-Pierre and Miquelon 1767. Joseph CYR, s/o Jean/Anne BOURGEOIS, m. at Massachusetts ca. 1760 to Marie-Josephe HEBERT, d/o Jacques/Anne ARSENAULT. Marriage rehabilitated at 1762 at Miquelon. Children: Joseph (1763); Charles (1765); Appoline (1770); Jacques (1773). Deported to Massachusetts 1755 and family at Miquelon 1762-1773. Paul CYR, s/o Guillaume/Marguerite BOURG, m. to Marie-Josephe RICHARD, d/o Pierre/Marie BOUDROT. Children: Marie-Madeleine (1744); Marguerite and Marie-Modeste (1746); Marie (1749); Jean (1752); Louise (1754); Paul (1760); Rosalie (1764); Joseph (1767). At Boston 1755 and Miquelon 1763-1774. Paul died at Miquelon 1772. Jean CYR, s/o Guillaume/Marguerite BOURG, m. to Anne BOURGEOIS, d/o Charles/Marie BLANCHARD. Children: Anne (1735); Joseph (ca. 1738); Jean (ca. 1740); Amand (1744); Hosène (1746); Marie (1750); François (1753). At Miquelon 1767 and Jean CYR died there 1776. Jacques HEBERT, s/o Jacques/Jeanne GAUTEROT, m. to Anne ARSENAULT, d/o Abraham/Jeanne GAUDET. Children: Pierre (1731); Marie-Madeleine(1732); Marguerite (1734); Jean (1736); Joseph (1739); Marie-Josephe (1740); François (1742); Jacques (1746); Anne-Marie (1746); Charles (1748); Ambroise (1750). At Massachusetts 1755 and St-Pierre et Miquelon 1767. Benoist MELANSON, s/o Paul/Marie TERRIOT, m. to Marie BENOIT, d/o Claude/Jeanne HEBERT. Children: Marie (ca. 1742); Etienne (ca. 1743); Joseph (ca. 1747); Marguerite (ca. 1748). At Massachusetts 1755 and Yamachiche, Québec, Canada 1767. Jean-Antoine MELANSON, possibly s/o Paul/Mar ie TERRIOT, m. ca. 1761 at Massachusetts to Françoise BENOIT. Children: Jean-Baptiste (ca. 1762); Marguerite, (1767); Pierre (ca. 1769); Marie-Josephe (1770); antoine (1773); Benjamin (1774). Settled at Yamachiche, Québec, Canada. Joseph VINCENT, s/o Pierre/Marie GRANGER, m. 1) ca. 1754 to Marie-Josephe DAIGRE; 2) ca. 1760 to Marie-Jeanne BENOIT. Children: Joseph (ca. 1735); Marguerite (ca. 1756); Françoise (ca. 1760); Pierre (1762); Simon (ca. 1764). At Québec 1766 and Yamachiche 1766-1774. Godefroy BENOIT, s/o Claude/Jeanne HEBERT, m. to Madeleine BABIN, d/o Pierre/Madeleine BOURG. Children: Joseph (ca. 1748); Marie-Françoise (1757); Paul (1767); Jean (ca. 1768); Pierre (ca. 1769). at Yamachiche after dispersion. No mention of deportation. François BENOIT, s/o Claude/Jeanne HEBERT, m. at Boston ca. 1761 to Françoise DAIGRE. At Yamachiche ca. 1767. Jacques VIGNEAU dit MAURICE, (also listed above) s/o Maurice/Marguerite COMMEAUX, m. 1725 to Marguerite ARSENAUJLT, d/o Abraham/Jeanne GAUDET, and ca. 1740 to Marguerite BOURG, widow of Guillaume CYR and d/o Michel BOURG/Elizabeth MELANCON. Children: Pierre (1720); Jacques (1730); Joseph (1732); Abraham (1733); Jean (1734). At Massachusetts 1755 and Miquelon 1767-1772. Was merchant at Baie Verte 1755. Pierre VIGNEAUX, s/o Jacques/Marguerite ARSENAULT, m. to Madeleine CYR, d/o Guillaume/Marguerite BOURG. Children: Pierre-Roche (1746); Marie-Modeste (1748; Rose (1753); Marie (1756); Jacques (1761); Marguerite (1764); Louis (1766); Jean-Baptiste (1768). At Massachusetts 1755 and at Miquelon 1763-1768. Jacques VIGNEAUX, s/o Jacques/Marguerite ARSENAULT, m. ca. 1753 to Rose CYR, d/o Guillaume/Marguerite BOURG. Children: Basile (1754); Marguerite (1757); Anne (1761); Blaise (1764); Charlotte-Françoise (1766); Hippolyte (1769); Etienne (1771). At Massachusetts 1755 and Miquelon 1763-1771. Joseph VIGNEUAX, s/o Jacques/Marguerite ARSENAULT, m. to Marie-Anne BOURGEOIS, d/o Jacques/Marie BOURG. Children: Angélique (1756); Louis (1761); Joseph (1764); Antoine (1766); Laurent (1768); Marie-Modeste (1771); Jean (1774); François-Xavier (ca 1775). At Massachusetts 1755 and Miquelon 1763-1771. Some children settled at Bécancour, St-Grégoire and Nicolet, Québec, Canada after 1780. Joseph died at St-Grégoire 1814. Abraham VIGNEAUX, s/o Jacques/Marguerite ARSENAU, m. to Marie BOURG, d/o Michel/Marie CORMIER. Children: Rebecca Marie (1758); Henriette (1760); Isaac (1762); Modest (1765); Marie-Anastasie (1767); Rosalie (1769); Jeanne (1773); Anne (ca. 1774); Paulaume (male) 1775); Madeleine (1778). At Massachusetts 1755, at Miquelon 1763-1776 and Bécancour, Québec, Canada 1785. Jean VIGNEAUX dit l'ECRIVAIN, s/o Jacques/Marguerite ARSENAU, m. to Marie BOURGEOIS, d/o Jacques/Marie BOURG. Children: Etienne (1755); Jeanne (1758); Marie (1761); Anne Polonie (1770); Jacques (1774). 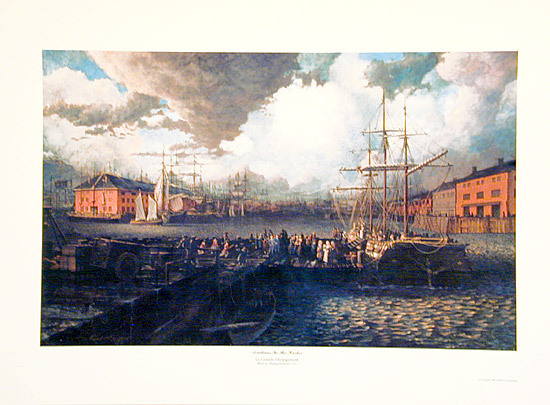 At Savannah, Carolina 1755; Boston 1763 and Miquelon 1764. Only one Bénoni DOUCET: s/o Pierre/Marie CAISSY, m. to Marguerite BOUDROT, d/o Paul/Marie HEBERT. No children listed. Possibly Jean Jean GUIDRY, s/o Pierre/Marguerite BRASSEAU, m. to Marguerite PICOT ca. 1755, d/o Michel/Anne BLIN. Children: Elizabeth (ca. 1754); Joseph (1757); Joseph (1759); Jean-Charles (1760); Olivier (1764); Marguerite (1766); Pierre (1770); Marie-Judith (1772); Marie-Anne (1774); Augutin (1775). At Massachusetts 1755, Québec 1766, and St-Jacques l'Achigan, Québec, Canada 1767. Possibly Joseph BREAUX, s/o Joseph/Elizabeth THIBODEAU, m. ca. 1761 to Marie-Anne PICOT, d/o Michel/Anne BLIN. Children: Elizabeth and Marie (1767); Joseph (ca. 1768); Félicité (1771); Marie-anne (1773); Jean-Baptiste (1777). At Massachusetts 1755 and Laprairie, Québec, Canada in 1767. Possibly Pierre LANDRY, s/o Claude/Marguerite TERRIOT, m. to Cécile ROBICHAUD, d/o Alexandre/Anne MELANCON. Children: Marguerite (1726); Anne (1730); Cécile (1732); Marie (1734); Marie-Madeleine (1737); Nathalie (1740); Jean-Baptiste (1742); Isabelle (1745); Pierre (1748). Possibly Jean LANDRY, s/o Antoine/Marie THIBODEAU, m. to Madeleine MELANSON. Children: Antoine (1720); Marguerite (1724); Marie (1725); Jean (1728); Anne (1729); Joseph (1733); Paul (1735); Simon-Pierre (1737); Charles (1738); Anselme (1741). Paul LANDRY, s/o Jean/Madeleine MELANCON, m. at Massachusetts 1759 to Rosalie BENOIT, d/o Claude/Marie COMEAU. Marriage rehabilitated at Trois-Rivières 1767. Children: Marie (1760); Paul (1762); Jean (1764). at Yamachiche, Québec, Canada 1767. Pierre LEBLANC, s/o René/Jeanne LANDRY, m. to Claire BOUDROT, d/o Claude/Catherine MEUNIER. Claire died 1741 at Grand-Pré according to Arsenault. Children: Pierre (1741); Marie-Blanche (1743); Elizabeth (1745). At Massachusetts 1755 and Cap-Sable, Nova Scotia, Canada 1769. Alain-Castin THIBODEAU, s/o René/Anne BOUDROT, married in U.S. 1761 to Nathalie HEBERT, d/o Alexandre/Marie DUPUIS. Marriage rehabilitated 1767 at Trois-Rivières. Children: Joseph (ca. 1762); Jean-Baptiste (ca. 1768). Deported to Massachusetts 1755 and were at Yamachiche, Québec, Canada 1767. Jean-Baptiste VIGNEAU, s/o Maurice/Marguerite COMEAU, married to Agnès POIRIER, d/o Michel/Madeleine BOURGEOIS. Children: Marie (1740); Jean-Baptiste (1742); Marie-Théotiste (1744); Amand (1746); Marguerite (1748); Anastasie (1751); Marie-Esther (1753); Jacques (1758). At Miquelon 1771; some children at Bécancour, Nicolet, St-Grégoire, Québec, Canada 1785. Jacques LEBLANC, s/o François/Marguerite BOUDROT, m. 1758 at Philadelphia to Nathalie BRAULT. Children: Marie (1759); Simon (1760); Isabelle (1762); Marguerite (1763); Anne (1766); Jacques (1767); Nathalie (1768). Deported to Philadelphia 1755, according to Arsenault. At Miquelon 1763; Halifax 1768; area of Tichibouctou, New Brunswick 1772 and at Memramcouk, New Brunswick 1775. Jacques Sr. died in Nova Scotia. Nathalie, his widow, m. second to Pierre LEGER at Memramcouk. Possibly François LEBLANC, s/o René/Anne BOURGEOIS, married to Jeanne HEBERT. 5 sons, 6 daughters, born before 1729. Only one Honoré in Arsenault: s/o Jacques/Catherine LANDRY, m. to Marie TRAHAN, who died at Liverpool, England ca. 1758. According to Arsenault, Honoré was at Belle-Isle-en-Mer, France in 1767 with family, and at Pisiquid after the disperson. Amand BREAUX, s/o Pierre/Anne LEBLANC, m. to Madeleine LEBLANC, d/o François/Jeanne HEBERT. Children: Anne-Marie (1746); Jean-Baptiste (1748); Joseph-Richard (17500; Madeleine (1752); Marguerite (1754); Marie-Anne-Ange (1758); Joseph-Amand (1761). Deported to Massachusetts 1755 and at St-Ours, Québec 766. Simon FOREST, s/o Pierre/Madeleine BABIN, m. ca. 1750 Marguerite GAUTEROT, d/o Jean/Anne LEBLANC. Children: Simon (1756); Maximien (1758); Ignace (1761); Marguerite (1763); Pierre (1766); Paul (1768). At Massachusetts 1755; Pisiquit (Windsor, N.S. )1771 and later at Arichat, Cap-Breton. Pierre PELLERIN, s/o Jean-Baptiste/Marie MARTIN, m. to Anne GIROUARD, d/o Charles/Anne BASTARACHE. Children: Anselme (1746); Pierre (1747); Anselme (1750); Anne (1752); Grégoire (1754); Jean-Baptiste (ca. 1755); Marie (1757); Olivier (1760); Joseph (ca. 1762); Judith (ca. 1765). Deported to Massachusetts 1755 and at Yamachiche 1771. Possibly Victor RICHARD, s/o Michel/Agnès BOURGEOIS, m. to Marie RICHARD, d/o François/Anne COMMEAU. One child, Anne, b. 1767. No mention of deportation and at Bécancour 1767. Possibly Paul LEBLANC, s/o Pierre/Madeleine BOURG, m. to Marie-Josephe RICHARD, d/o René/Marguerite BENOIT> Children: Joseph(1733); Charles-Grégoire (1734); Pierre (1736); Bonaventure (1738); Amand (1740); Nathalie (1742); Joseph (1744); Paul (1745); Basile (1748); Marie-Joseph (1749); François (1751); Jean-Baptiste (1754). At Massachusetts 1755, and Nicolet, Québec, Canada 1770. Possibly Simon LEBLANC, s/o Antoine/Anne LANDRY, m. to Marguerite TERRIOT, d/o Claude/Angnès AUCOIN. Children: Jean, b. 1754. Deported to New York 1755 and at St-Jacques l'Achigan ca. 1768. Several other Simon's, none married to a Marguerite. Possibly Simon BREAUX, s/o Jean-Anne CHIASSON, m. to Marie-Josephe MICHEL, d/o Joseph/Marie-Joseph BOUDROT. Children: Joseph (1747); Jean (1748); François (1750); Pierre (1753). Deported to Massachusetts 1755. Charles BELLIVEAU, s/o Antoine/Marie TERRIOT, m. to Anne DUGAS. Children: Joseph (1733); Marie-Josephe (1735); Madeleine (1737); Charles (1740); François (1742); Jean-Baptiste (1744); Marguerite (1746); Anne (1750). Deported to Massachusetts 1755, and at Québec 1767. Jean-Baptiste BELLIVEAU, s/o Antoine/Marie TERRIOT, m. to Marguerite MELANSON, d/o Jean/Madeleine ST-SEINE (PETITOT dit ST-SEINE). Children: Joseph (1741); Charles (1744); David (1746); Pierre (1748); Marguerite (1750); Jean (ca. 1755); François (1758); Marie-Madeleine (1762); deported to Boston 1755 with family. At Nicolet, Québec, Canada 1766. Jean-Baptiste died at St-Grégoire de Nicolet, Québec, Canada 1808. Jean-Baptist PELLERIN, s/o Jean-Baptiste/Marie MARTIN, m. to Marie-Josephe BOURG, d/o Abraham/Marie DUGAS. Children: Paul (1746); Etirenne (1748); Marie-Josephe (1751); Jean-Baptiste, (ca 1752); Isidore (ca. 1753); Joseph (1757); David (1762); Marie-Anne (1768). Deported to Massachusetts 1755 and established at St-Jacques l'Achigan, Québec, Canada 1767. Please click on the State you would like to research.